he bibliography of Ukrainian wooden architecture for our website is created by Mykola Zharkykh. It is a part of his larger work - "The bibliography of old Ukraine, 1240 - 1800". 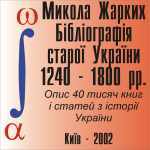 The "Bibliography of old Ukraine" is available on CD's.